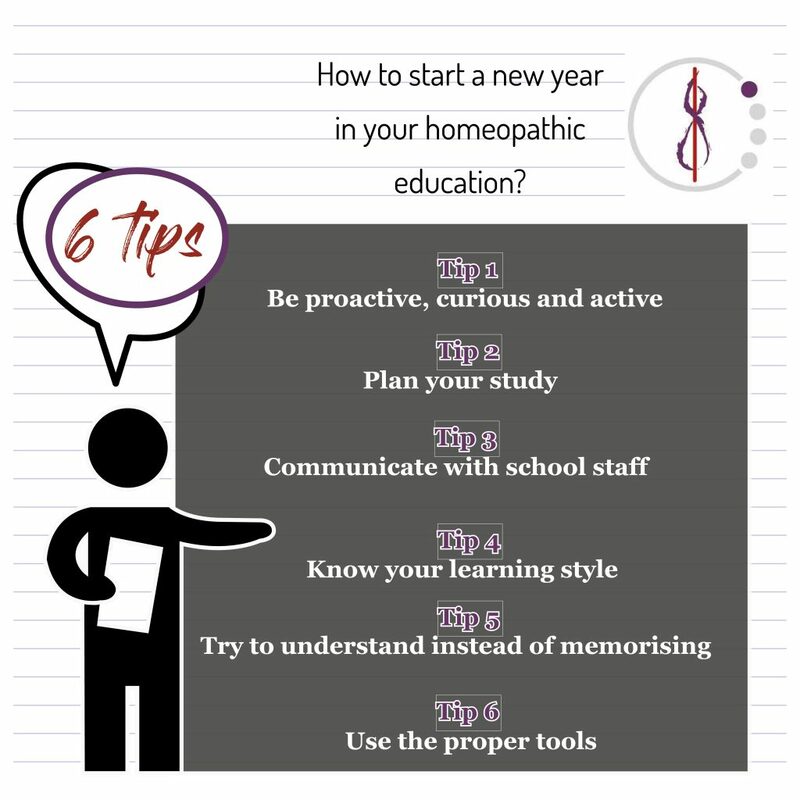 How to start a new year in your homeopathic education? The new year has started so for many people, it is time to make new year’s resolutions. Besides the traditional resolutions such as losing weight, more exercising, quit smoking and relax more often, for a student it could also be to study more efficiently or better. That is why we want to show you a few tips and tricks. Several tips are also useful for students from other homeopathy schools. These tips and advices are based on years of experience with students who study homeopathy. Of course, there is no universal method of studying that works for everyone and you will have to find a method that suits your personal style of studying. Please have a look at the tips mentioned below and use whatever is useful in your situation. A successful study of homeopathy is not completely dependent on your intelligence or talent but mainly depends on effort, methodology and way of working. You can get very far with good planning, efficient time management and using the proper tools. It is paramount that you realise this, so you can apply the tips mentioned below and do not get intimidated by the amount of study material. Other qualities that are more important than IQ are: being proactive, curious and active. Do not wait until you are explained everything or hope that a question will be asked by another student. One of the most important tips we can provide you is that you must try to schedule all activities for the course very well, preferably further ahead than the next couple of weeks. In our yearbooks, we provide you with detailed information about what you need to do and when this needs to be done. Try to make a personalised schedule that contains information about what and when you are going to spend time on, and try to stick with that schedule. But on the other hand, be kind to yourself if the original planning does not work out at certain moments. Just change the planning accordingly. For these situations, it is a good idea to accommodate some time for unforeseen circumstances in your original planning. Of course, you can create a plan with the use of a paper calendar but you can also use your personal calendar in the digital environment. The benefit of this is that this is already aligned with the general school calendar, so you can easily see when deadlines and classes are and personalise your study time accordingly. When creating a schedule for studying the course it is important to incorporate time for relaxation and rest. Without relaxation, it is impossible to study for a long time. Per study session, you could use the pomodoro technique to avoid distraction. Perhaps it sounds strange, but success during your studies is also dependent on good and adequate communication with the staff of the school. If, for example, you encounter problems in your private life, then it is wise to discuss this in time with your teacher, dean or administration of the course. In this way, we can keep this in mind and can try to think of solutions so you will be able to continue your studies. Of course as far as is possible. Unfortunately, we see too often that students do not communicate properly and problems arise when assignments are not finished in time or exams are not passed because something has happened in the private life of a student. Of course, you do not need to discuss everything that happens in your private life, and we do not want to intrude, but proper and adequate communication can help to avoid misunderstandings. Also in less severe situations, it is useful to communicate efficiently and proactively. With all assignments which you have to do at our homeopathy school, you have several communication tools at your disposal, such as e-mail, phone, comments in documents, etc. but there is also sufficient time to ask questions during the classes. So our advice is to prepare sufficiently before classes and make sure you write down any questions and doubts you encounter during your study so you can ask about this during class. If this is not practical, then please send an e-mail or what is often more efficiently: phone us. According to us, communication is also about concentration and attention during the classes. Digital devices such as laptops and phones are fascinating and can be useful, but they can also distract. That is why we ask you to put away your phone and laptop, so you are not distracted because this will greatly facilitate your understanding of what is being talked about. Communicating adequately and proactively sounds simple and obvious, but we see that in many cases this still is difficult to do. Not everyone learns and studies in the same way. One person is more visually oriented, while the other person prefers audio. Fortunately, we accommodate for that in the teaching material of our homeopathy course. For yourself, it is also useful to know what is the best learning style for you. Perhaps you do know this from experience, but it does not harm you to try to test what your learning style is. On the website Learning Styles, you can find an explanation and a link to a test. Please use this tip and make it your advantage. We see that a lot of students try to make notes of everything that is written in presentations and books. They try to record everything and hope that they can retrieve every detail later in the course or when they are working as a homeopath. According to us, it is, however, better to try to understand the homeopathic theory and materia medica instead of memorising it. Therefore, try to focus on understanding what is presented during classes and in the e-learning modules. And write down a summary of this in your notes. That is much better than writing down every detail, page number, specific symptoms or paragraphs of the Organon. During your clinical practice, it is not important to reproduce every detail as is mentioned precisely in the books or how it was explained during classes. It is far more important that you understand the theory and remedies. That takes less effort at the end, and it is much more flexible. That is also the reason why the exams at the Educational Center for Classical Homeopathy are open book exams. This topic is a difficult one because it is different for everyone. Some people like to use a notepad and pen, whereas others are completely comfortable with digital tools. Although we are a modern school and use contemporary technology during the course and classes, we still value the traditional pen and paper. It appears that writing with a pen makes retention of information better and it even makes the person smarter. But you can also use digital tools such as Google Keep, Google Docs, and Microsoft Word to make notes. Also, there are tools, apps and websites that can increase your knowledge of the English language such as Dictionary.com and Merriam Webster and one of the best websites to update your medical knowledge is Merck Manual Professional. However, the most important tip we can provide you with is that you need to keep the long-term in mind: do not fill huge binders with notes that you will not read anymore. At the Educational Center for Classical Homeopathy, we will provide you with several tips to be able to make notes efficiently and consult your notes easily.